If any test fails (i.e. driver does not react appropriately or speed is beyond the limit), an emergency braking occurs. The 1000 Hz magnet is usually placed with the distant signal, i.e. some 1000 m before the main signal and some 1200 m before the danger point protected by that main signal. That danger point could be e.g. a clear-of-points marker, a crossing etc. If the 1000 Hz magnet is detected, the driver has four seconds to acknowledge by pressing the "Indusi Wachsam" (Indusi on alert) button . Then, the train's speed is constantly compared against a limit, which starts at 165 km/h and within the next 23 seconds is lowered to 85 km/h (brown curve). If the train does not stop (e.g. because of a halt or platform), and no 500 Hz magnet is detected, the limit is maintained at 85 km/h until 1250 m after the 1000 Hz magnet. 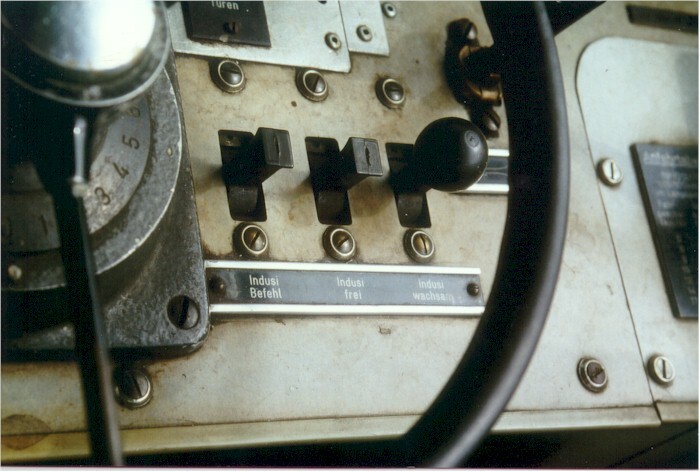 At 700 m after the 1000 Hz magnet, the driver can press the "Indusi frei" (Indusi release) button to end the speed restriction, e.g. if he can see that the signal in advance has changed to clear. This is called "to release oneself from the (1000 Hz) speed control". However, if the driver has released himself from the 1000 Hz speed restriction, and then a 500 Hz magnet is detected within 1250 m after the 1000 Hz magnet, indicating that the signal is still at stop, the driver probably has wrongly released himself from the speed control and gets - an emergency braking, what else? The 500 Hz magnet is placed at some 150 to 250 m before the main signal, or about 450 m before the danger point. If a 500 Hz magnet is detected, a speed limit of 65 km/h is applied and lowered to 45 km/h within the next 153 m, then stays at 45 km/h for the next 250 m (red curve). Release from that limit is not possible. Note that if the restriction to 45 km/h has ended 403 m (153 m+250 m) after the 500 Hz magnet, the restriction to 85 km/h imposed by the 1000 Hz magnet may still be active. The 2000 Hz magnet is placed with the main signal, or at some 200 m (down to 50 m or up to 400 m in special cases) before the danger point. A detection of a 2000 Hz magnet always causes an emergency braking. If our driver made it until here (without emergency braking), his speed is at maximum 45 km/h, so the braking should get him to stop before the danger point, even if he chooses to pass the red signal, so even a SPAD1 shouldn't cause an accident. If the train halts, or travels for at least 15 seconds at less than 10 km/h, while either of the 1000 Hz or 500 Hz speed control is still active, the applicable speed limit is lowered by 20 km/h, we say it becomes restrictive. A restrictive 500 Hz-induced speed limit is maintained for the next 200 m, if the restriction is activated until 100 m after the 500 Hz magnet, for the next 250 m otherwise. This is to ensure that a train which has halted before the main signal, e.g. at a platform stop, can only accelerate to a speed that still permits the train to stop short of the danger point, should it detect the 2000 Hz magnet, i.e. it had run the red signal.